The MALÅ CX-12 Concrete Imaging System is a Ground Penetrating Radar (GPR) system that is designed for ease of use for non-destructive testing and inspection of concrete and other structures. This concrete imaging system allows inspectors to scan concrete structures to locate and identify metallic and non-metallic objects or features that could pose a danger to equipment and personnel during cutting, coring or drilling of the structure during construction. 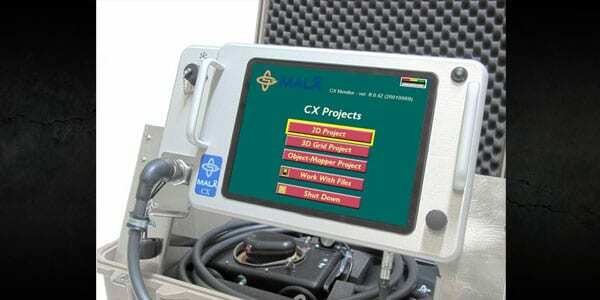 The MALÅ CX-12 System offers three project measurement modes – 2D, 3D Grid and Object Mapper. Each mode allows system operators to scan concrete structures safely and in real-time. This leads to more timely inspections, safer operating environments, as well as a more cost-effective option compared to other competing systems or traditional radiographic methods. The GPR system features an ergonomic and rugged design meant to withstand tough production environments, and is equipped with full remote capabilities. With a simple and intuitive user interface for ease of use, inspectors view results on a clear and bright LCD display. The optional field harness and included case add greater portability and flexibility to the system. Additional safety features are built into the system such as the ability to detect 50/60 Hz energized metallic conductors within the concrete structure, and void detection. The MALÅ CX-12 Concrete Imaging System also integrates with the Mala 3DVision visualization software to manage collected project data. See brochure for details. and easily investigate areas prior to cutting, coring or drilling.